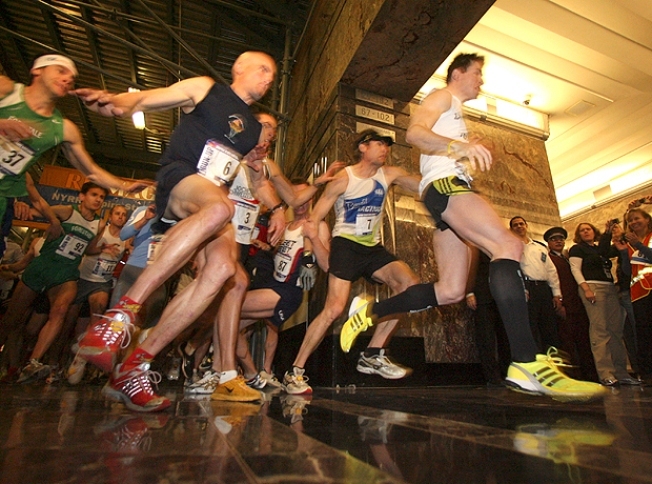 Thomas Dold, right, of Germany, takes the lead of the men's pack at the start of the Empire State Building Run-Up, Tuesday, Feb. 3, 2009 in New York. Dold would go on to win for the fourth straight year. It wasn't the big, bad wolf who was huffing and puffing on Tuesday. It was the 300 or so crazies who chugged up the stairs for the 31st Empire State Building Run-Up. News4's Cat Greenleaf was among those who accepted the challenge of running up 86 flights of stairs, 1,576 steps in all. Germany's Thomas Dold won the men's division for the fourth time in a row. He finished in 10 minutes, 7 seconds. Cat Greenleaf joined many others who braved their way up the steps of the Empire State Building Tuesday. Suzy Walsham, of Australia, captured the women's crown for the third straight year at 13:27. How did Cat fare? Well, you'll just have to watch the video to the left to find out.